Still image from Ben A. Holocaust testimony, July 11, 1983. SynopsisBen A. was born Vilna, Poland [Vilnius, Lithuania] in 1921. He describes his family and the Jewish community. He recalls antisemitic incidents. He describes the Soviet occupation. He recalls the influx of Jewish refugees from Poland in 1939. He describes fleeing to Minsk during the German invasion and returning to Vilna. Ben discusses working forced labour and ghettoization. He discusses mass killings in Ponary and learning his mother and siblings were killed there. He discusses hiding during round-ups. He discusses the Judenrat. He describes partisan actions in the ghetto. He describes leaving the ghetto to HKP forced labour camp in 1943. He describes conditions in the camp and receiving assistance from a German guard. 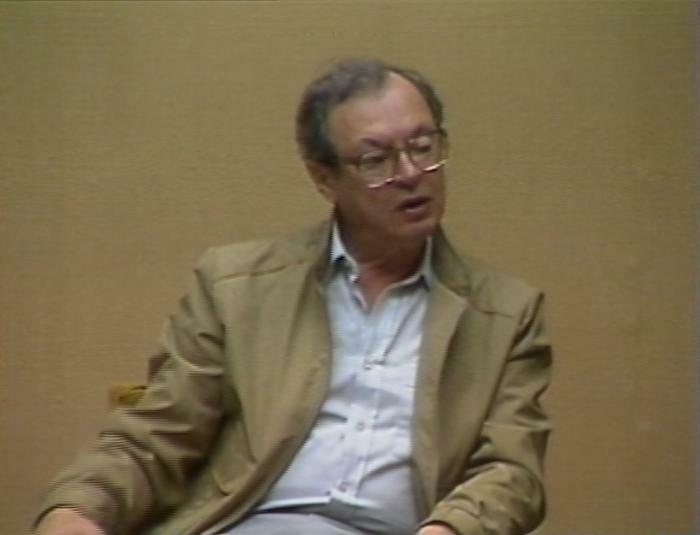 Ben describes escaping the camp and hiding until liberation by Soviet troops. He recounts being conscripted into the Russian army and desertion in Vilna. He describes traveling to Łódź and reuniting with his sister. He describes fleeing to Austria, his arrest, and escaping to Linz. He recalls staying in a DP camp near Salzburg. He describes joining Betar, his marriage, and moving to Israel. He describes immigrating to Canada and his family. Ben shows photographs.